We all have spices in our cupboards that we never use. I personally have a shaker of garam masala that I used once two years ago and haven’t touched since. Well… there was one time I mistook it for nutmeg. Needless to say those pancakes ended up in the trash. You probably use your pumpkin pie spice once a year at Thanksgiving, but during this pumpkin-y time of year why not pull it out for some unorthodox uses? Not that the below are TOO out of the box, but perhaps they’re new and exciting to you. I do hope that’s the case. Pop the popcorn in an air popper. Meanwhile, in a small saucepan melt the butter over low heat. Watch the mixture closely as the color turns from white and yellow to a light brown. As soon as the butter is a light brown color, turn off the heat. Mix in the maple syrup and the pumpkin pie spice and stir to combine. Pour half the mixture over the popcorn and toss to coat. 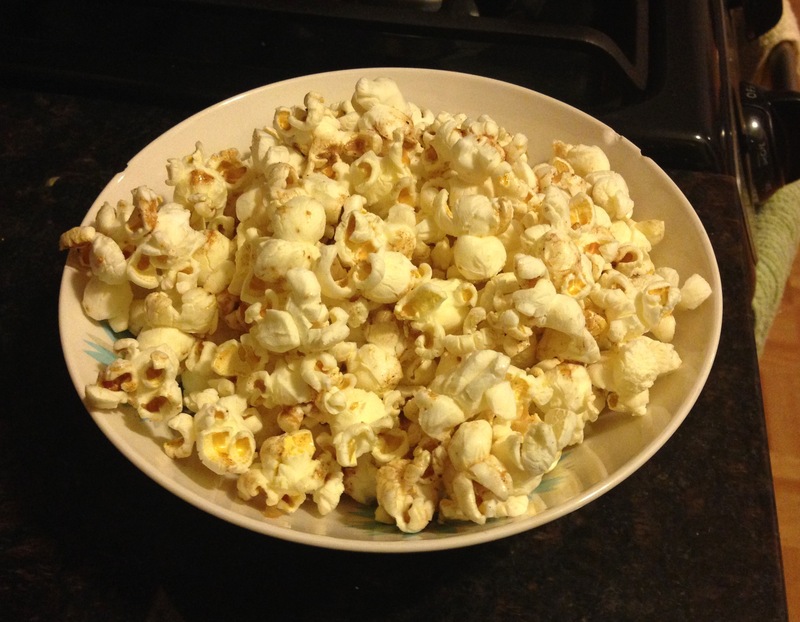 Pour remaining butter mixture over the popcorn and toss to coat. Serve immediately. Make pancakes according to this recipe. In a small frying pan, melt butter over medium heat. Once butter is melted, add apple slices and stir to coat. Cook apples for approximately 5 minutes or until they soften. Add maple syrup and pumpkin pie spice. Stir to combine. Cook for another 2 – 3 minutes or until mixture is heated through. 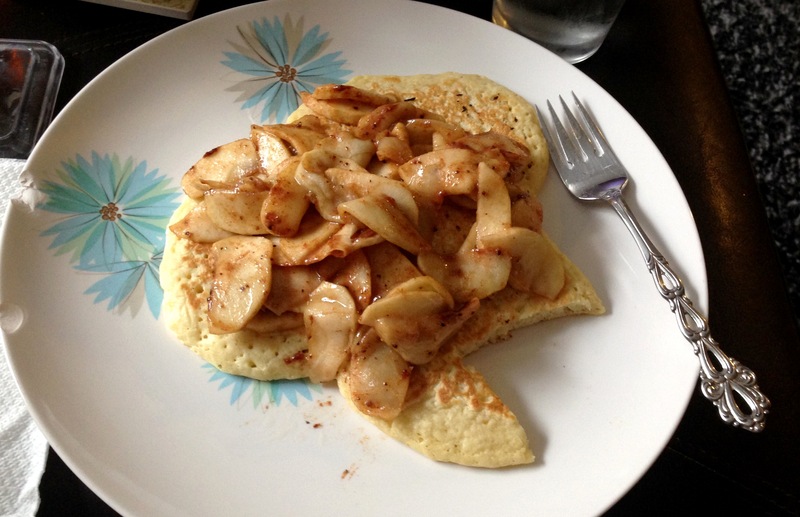 Top pancakes with sauteed apples and serve. 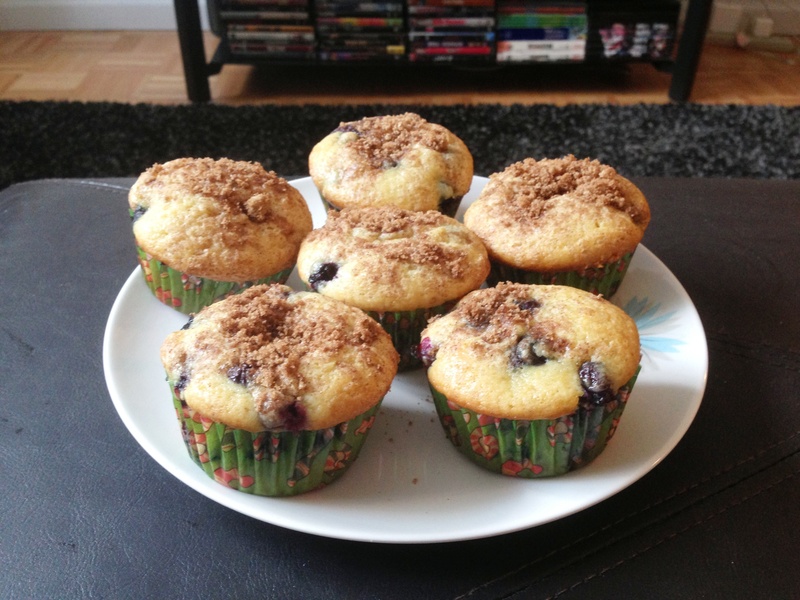 I love an easy muffin recipe. Baking in the morning for breakfast can seem a little daunting, but when you’re basically chucking all ingredients into a bowl, stirring, and throwing them in the oven, the workload is on par with omelets and pancakes. Don’t be scurred. Preheat oven to 400 degrees. Line muffin tin with muffin liners. In a medium sized bowl, stir together vegetable oil, sugar, eggs, and vanilla until combined. Add flour, baking soda, and salt and stir to combine. Add sour cream and stir until completely combined. Fold in blueberries. Pour until cups are almost full. In a small bowl, stir together the cinnamon and brown sugar. Sprinkle evenly over muffins. Bake for 23 – 28 minutes or until a toothpick inserted in the center of one muffin comes out clean. Let cool in the tin for about 10 minutes and then move to a baking sheet to cool completely. Eggs are by far one of the most difficult dishes to make for a brunch. Unless you hire someone to work an omelet station, you’re probably going to resort to a frittata or quiche to serve to a group. But even then, you have to slice and serve it… and I was kind of aiming for little to no work during this brunch, you get me? Enter personal sized frittatas. These are hilariously easy, and although gruyere is on the pricey side, it has that decadent flavor that makes this dish taste way more high end than it actually is. Preheat oven to 375 degrees. Spray a muffin tin with cooking spray. In a large bowl, whisk together the eggs, milk, pepper, and salt until foamy. Fold in the ham and gruyere. Pour into the muffin tins until the cups are almost full. Bake for 12 – 15 minutes or until the eggs are puffed up and slightly browned. Serve hot. Pumpkin bread is one of those dishes you can make for a brunch last minute in case, say, the bread you planned to make that took you 2 hours the night before, the bread you created specially so that your friend who can’t eat gluten could still enjoy every dish at your brunch, the bread that made your whole apartment smell like incredible grapefruit-scented-vanilla cake for an entire day … yes… that bread… came out like a fat, gooey, undercooked, flat brick. In a small bowl, whisk together the flour, salt, sugar, and baking soda. In a medium bowl, mix together the pumpkin puree, vegetable oil, eggs, water, and spices. Slowly add the dry ingredients to the wet ingredients just until incorporated (careful not to overmix). Grease a 9 x 5 x 3 loaf pan with butter and pour in the batter. Bake for 50 minutes. Let cool in the pan for 10 minutes and then remove and let cool on a rack. Growing up, I lived in a neighborhood where all the families were very close. One family’s kids babysat for the younger families’ kids, cups of sugar and milk were always being lent out, and when it came to Christmas time, all the families gathered in one house on Christmas Eve to enjoy brunch and the holidays together. Those brunches are some of my favorite memories, and it was never about the food (of which there was always tons). I decided to host my own little brunch this weekend in the spirit of the holidays… and of day drinking. Now that I’m older, I realize everything is more festive with champagne. This week I’ll provide you with recipes and tips to host your own holiday brunch that allows you to truly enjoy the company of friends and family without spending the entire party in the kitchen slaving over the stove. First on the week’s menu list is a delicious, decadent, cheesy potato casserole that you can make the night before and pop into the oven the morning of brunch. Little work plus even less time? Hey favorite new recipe. Hey. In a skillet, melt the butter over medium heat just until the butter starts to brown. Add diced onions, garlic, and sundried tomatoes and cook until the onions are translucent. Pick out the sundried tomatoes with tongs and discard. Turn off the heat. In a separate bowl, whisk together the eggs and mustard. Add the milk, salt, and pepper and whisk thoroughly. Fold in the cheddar cheese, frozen potatoes, and vegetables from the skillet. Mix until combined. Pour mixture into a greased 9 x 13 pan. At this point, you can refrigerate the casserole for up to 24 hours. Bake for 35 – 45 minutes or until the top and sides are a golden brown. Serve hot. NOTE: the original recipe from The Kitchn calls for thinly sliced sundried tomatoes that you do not pick out of the onions. I like the flavor they bring to the dish, but I’m not a fan of chewy sundried tomatoes… and neither are most people I know. The flavor is still there if you pick them out, but it’s not overwhelming. Done and done. It wouldn’t be right to post at all about anything this week without mentioning last week’s East Coast hurricane. The BF and I were incredibly lucky to get through it completely unscathed but I know we’re in the minority. Don’t forget, if you haven’t already, to donate money, supplies, or your time in any way you can. Find out how here. In happier news, this hash is DELICIOUS. It’s from The Kitchn and the recipe has been sitting in my “To Make” list for over a year now. 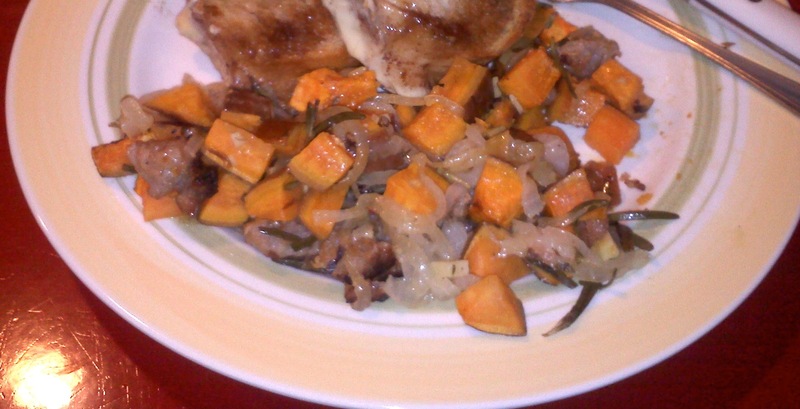 It seems like there’s always someone I’m cooking for who doesn’t like meat, or sweet potatoes, or onions. But this past weekend I had some dear friends in town and they eat anything (my favorite kind of friends, mind you) so it seemed like the perfect time to finally try it out. Preheat oven to 450 degrees. Cover a large baking sheet with foil. Cut onions in half and then slice each half into thin half moons. Heat a medium sized frying pan over medium heat and add onions, stirring occasionally until the onions cook down and start to brown, about 30 minutes. Meanwhile, in another frying pan, cook the sausage over medium/high heat for around 15 minutes, breaking the sausage apart so it’s in small, crumbly pieces. Once the onions and sausage are cooked, in one large bowl add sweet potato chunks, sausage, onions, minced rosemary, minced garlic, and olive oil and toss until everything is coated in olive oil. Spread on the covered baking sheet (don’t worry if it’s not in a single layer, it doesn’t really matter). Roast in the preheated oven for 4o minutes, or until sweet potatoes are easily pierced with a fork. In a large frying pan, fry the eggs just until the outside is cooked and the center is still runny. Top each serving of hash with a fried egg. NOTE: The Kitchn‘s recipe has a lengthy second step where you cook the eggs over the hash in a skillet for 20 minutes, but to me that just meant a lot of extra time and another dirty dish. It looks lovely, but ultimately felt unnecessary. And lastly… that photo above is missing the egg. I was last to eat (the cook eats last! ), and I was too lazy to crack another egg. But the hash looked nice so, voila. I don’t know too many people who like preparing elaborate breakfasts on weekday mornings, including me who is sans day job at the moment. I prefer cereal and the occasional bagel if I have an extra minute. But The BF grabs whatever is handy and races out the door, eating later at his desk while checking email. He’s not a big fan of hot oatmeal and one can only eat bananas for so many meals, so I decided to try and come up with something that he’d look forward to eating but that also didn’t start his day off with a total calorie fest. I found these incredible and surprisingly healthy breakfast bars on “Oh She Glows” (don’t worry, guys, men can eat these, too) and added a few things to make them BF-friendly. Preheat oven to 350 degrees and line an 8 x 8 inch pan with parchment paper. Blend 1 cup of rolled oats in a blender or food processor until it forms a fine flour (you can skip this by buying oat flour and just using 1 cup of it). Add oat flour, remaining 1 1/2 cups of rolled oats, chia seed, flax seed, cinnamon, baking powder, and salt to a large bowl and whisk until combined. In a separate bowl, whisk together milk, honey, peanut butter, banana, and vanilla until combined (obviously the chunkier ingredients won’t fully combine but do the best you can). Add this bowl to the dry ingredients and mix until combined. Pour into the prepared pan and smooth over so the batter is even. In a small saucepan, combine orange juice and jam. Over low/medium heat, cook until the mixture becomes smooth with no lumps. Pour the hot jam over the batter in the pan until the bars are completely covered. Bake for 35 – 40 minutes. Let cool on a wire rack for 10 minutes and remove from the pan. Let fully cool before cutting into squares. Note: You could do virtually anything you want with these bars. 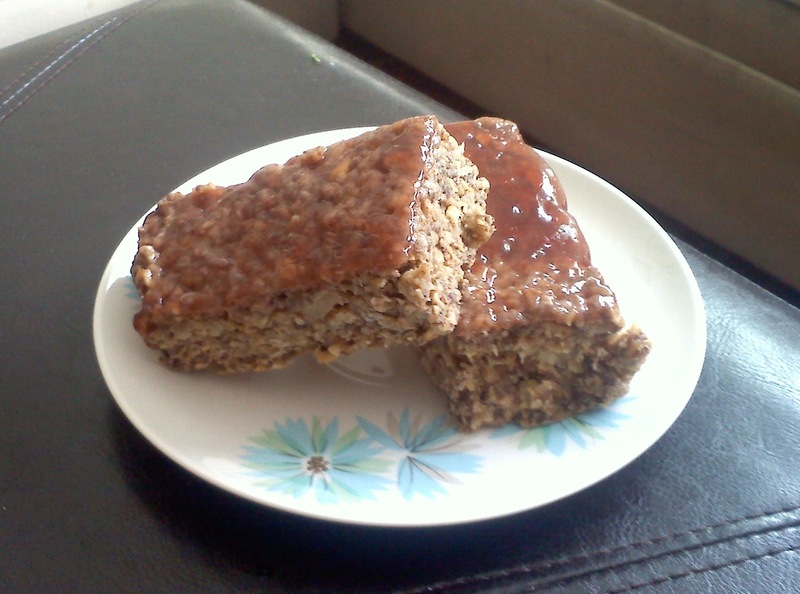 I was thinking a pumpkin pie oatmeal bar would be to die for, with the addition of a cup of pumpkin puree, 1 tsp nutmeg, 1 tsp all spice, and maybe a crumble of brown sugar on top (removing the jam and PB and banana, of course). Still just as healthy as the above recipe and a completely different taste. Last note! : Read all about the health benefits of chia seeds and flax seed by clicking the links. It’s pretty incredible!